My buddy got his GTX280 the other day but he hasn't been able to get it running yet. I've helped as much as I can but I'm out of ideas so hopefully someone here knows what's going on. 2 x 6 pin connectors from the PSU are plugged into the 2x6 -> 8-pin adapter and into the 8-pin connector on the vid card. 2 x 4 pin connectors from the PSU into a 2x4->6 pin adapter and into the 6-pin connector on the vid card. Each time he power on the machine there's a red light on the vid card which I assume means it's not powering on. Machine runs fine when he puts his 2 x 7600GT's back in. Seems like you may be tripping the OCP on the power supply. The PSU doesn't have 8pin PCI-E connectors, thats why he's using adapters. It is a 4-rail which will put out up to 18A on each rail. I'd be tempted to try plugging one 6pin directly to the card, and one 6pin to the 8pin adapter. From my quick look, that should supply up to 36A. I think the problem might be that that the molexs are on the same rail as the 24pin, and aren't supplying enough juice to the 6pin connection. You have tried it in another machine to make sure it works? I'm baffled by your post! Seriously. And you need to plug in the 6+2 and the 6 for the GPU. You shouldn't need ANY adapters whatsoever unless you have an older model. GSX 700W does NOT have an 8-pin connector. 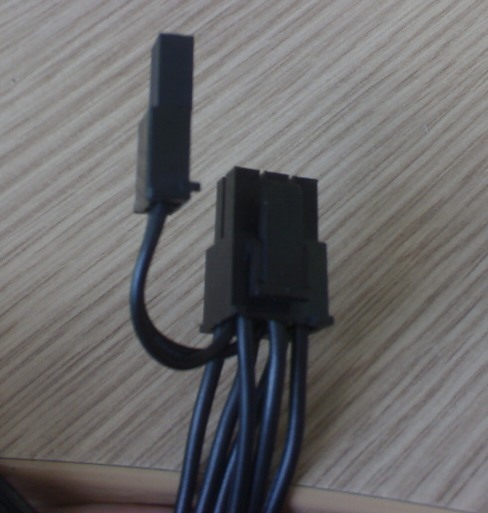 Here is what you can try: plug the 8pin adaptor into your PCI-E cables and use a Molex to 6-pin adaptor for the other PCI-E connector. Not working for him for some reason though...faulty card maybe? Ah well make sure he's only using 1 adapter and that its not plugged into ANYTHING else. If I had to guess, it'd be that the "adapter" is overloading one of the 18a rails. Not sure if there is a breakdown of the 12V rails, but have you tried using a different molex bundle?